"Casa De Romantica" Embraces The Meticulous Architecture Of This Luxurious Hacienda Estate! 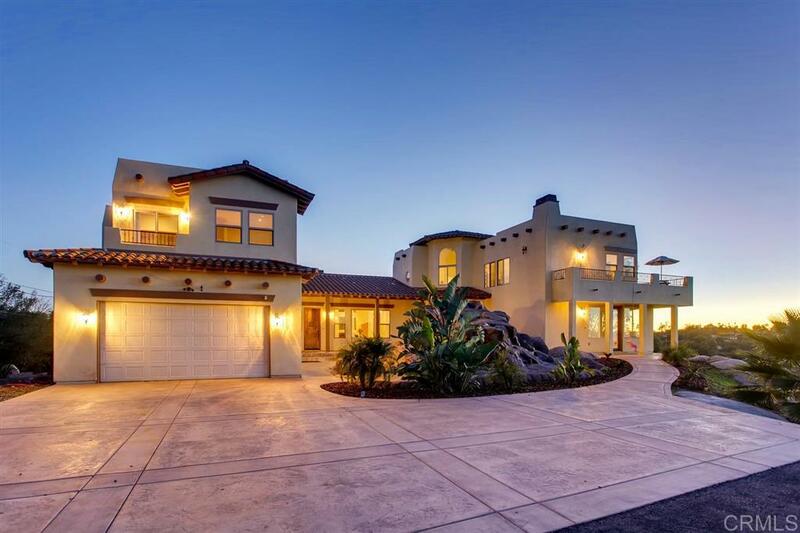 Set Upon 1.3 Acres Of Natural Boulder Landscape With A Back Drop Of Majestic Mountain Views, Breathtaking Sunrises & Sunsets Overlooking All Of San Diego! Offering Unlimited Possibilities With Multi-Family Living. This Beautiful Estate Offers An Elegant Sense Of Ease And Intimacy As You Enter Into This Architectural Masterpiece. Every Luxury Amenity And Quality One Would Sought After Is Captured At Every Turn!, The Architectural Authenticity Marries With Graceful Elegance In Every Detail. Upon Entering Into The Expansive Appx. 15ft Tall Ceilings With Exposed Rich Wood Beam Ceilings You Feel As Though You've Entered A Castle. Downstairs Is The Main Entertainment Living Showing The Visionary Experience! This Gourmet Kitchen Is Surrounded By Rich Espresso Color Cabinetry, Luxurious Granite Counters And Stainless Steel Appliances (5 Burner Cooktop, Double Oven), Large Walk-In Pantry, Veggie Sink As Well As Many Custom Built-Ins! With Extreme Entertainment In Mind The Kitchen Opens To A Built-In Bar Area Adjoining The Beautiful Large Living Room Surrounding By Entirely All View Windows And A Granite Faced Fireplace. On The West End The Master Wing Is Situated Privately Up Its Own Staircase Entering Into A Rotunda Room, The Master Suite Is Magnificent With It's Own Private Balcony Overlooking The Entire City And Mountains, Comforted By A Beautiful Fireplace, Master Bath Has A Large Travertine Shower And Amazing Step Up Bathtub Area To Enjoy Sunsets, Bath Surroundings Are Beautiful Quality Travertine! His/Hers Vanities, HUGE Walk In Closet. On The East End Is An Additional Staircase Another Master Bedroom As Well As Two Additional Bedrooms, Downstairs Is Another Bedroom, Bathroom and Indoor Laundry Room. There IS SOLAR, 2 Tankless Hot Water Heaters, Padre Dam Water, Fully Automatic Irrigation, Property Is Fully Fenced With Automatic Private Gate, Propane Gas. The 1.3 Acres Is Entirely Usable, Great Set Up For Family Parties, Room For Livestock, Horses, Tons Of Parking For RV/TOYS, There Is A Very Nice Additional Clubhouse/Exercise Room/Storage With Electricity. There Is A Magnificent Waterfall In The Center Courtyard Area. The Home Is Great For A Large Family Wanting Kids Wing, Or Multi-Family Living Or Simply The Family Looking For The Ideal Home To Entertain Guests!